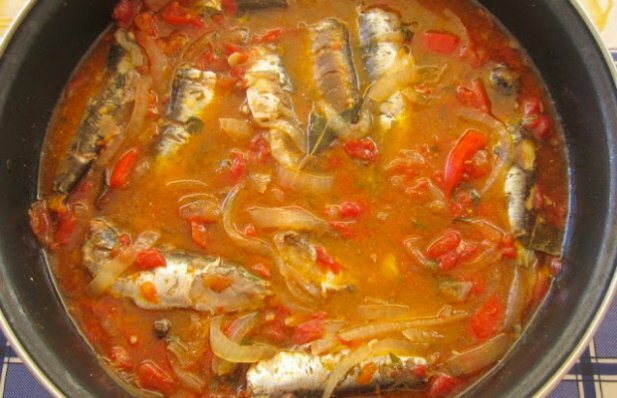 This Portuguese sardine stew recipe (molho de sardinhas) makes a mouth watering, delicious meal, served with boiled potatoes. Clean the scales, remove the guts and heads of the sardines, place them in a bowl with coarse salt and let it sit for about 2 hours. In a pot, place the olive oil and the chopped onion, add the sardines on top (after rinsing them in cold water). Add the tomatoes, the garlic, bay leaves, peri-peri pepper, parsley, mint leaves, oregano, sweet chilli and red pepper. Drizzle with the white wine. When cooked, uncover the pan and let it sit for about 5 minutes. 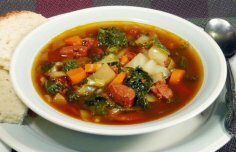 Serve it hot accompanied with boiled potatoes. 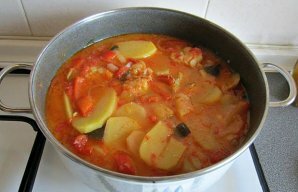 This Portuguese cod stew (caldeirada de bacalhau) recipe is very easy and quick to make and it's delicious. 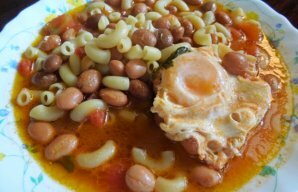 This Portuguese bean and pasta soup recipe (receita de sopa de feijão com massa) makes a very hearty meal.